Next in my Best of Eleuthera series I take a good look at the Island Made Gift Shop in Gregory Town. Pam Thompson – the owner – has a real treasure trove here – there is something for everyone to love – I defy you to come out of this shop without at least one thing – even if it is just a bumper sticker with ELH on it – for Eleuthera – get it !! Pam opened the shop in 1985 – how fabulous to be looking at her 30 year anniversary this year – and she truly deserves all the success she enjoys as she has redefined what an island gift shop should be. 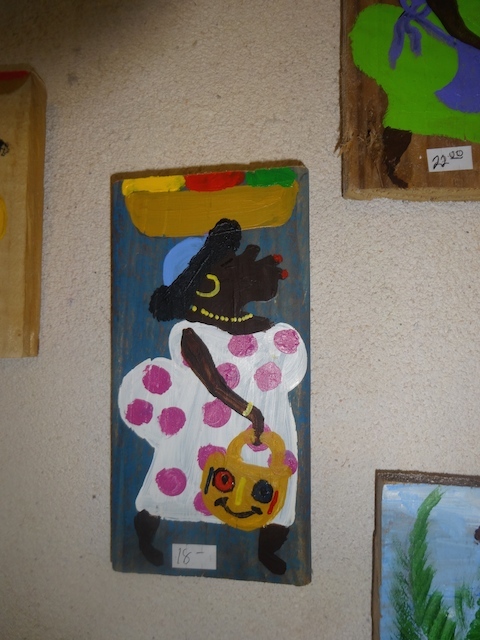 She is a very talented and creative woman and not only does she sell her own works – painted driftwood panels, hand painted T shirts, shell and sea glass jewelry, fantastic driftwood jewelry and even driftwood christmas trees – but she also has become a magnet for local people throughout the island selling their wares as well. I visited her in the shop and took lots of pictures of things that I really loved – I mean really loved – I wasn’t just being polite !! Pam first came to Eleuthera in 1976 on a surfing trip with a couple of girlfriends – met her husband Gregory who was then a commercial diver and quickly got married and settled here. She started the gift shop when her 3 daughters were young and her ethos for the gift shop was about using what she could find here to make goods for the shop. Necklaces with Eleutheran pink sand in a glass bottle…. lovely idea….. I liked this necklace so much I bought it ! One of their latest designs is a very classy one with small logo of the map of Eleuthera on the front and a mail stamp on the back….. So if you want to find good quality, classy design and huge variety make sure you pay a visit to Pam’s shop in Gregory Town. Her 2 assistants Jennifer and Tiffany do a great job and will help you find all sorts of treasures…… Whether you live here in Eleuthera like me or if you are paying a visit you can find the perfect small gift to take back with you and remember it will be island made……. Don’t you just a helpful thing like this – being able to borrow a pair of glasses to check out the details ! Goombay Smash mugs made in Nassau by the disabled…..
Beautiful story Kathy on a fabulous place. I totally agree on what a treasure Island Made is on the island! Pam does a great job and I never fail to find something I “must” have every time I stop in with my visitors! Yes – it was an expensive visit to interview her as there were several things that I had to have as well ! John and I discovered this shop on our drive around the Island. It is indeed a treasure trove and I bought a lovely pair of sea glass earrings. The prices were exceptionally reasonable too. I live in Tarpum Bay, but whenever I have guests, we make the trip to Gregory Town just to shop at Island Gifts. Like you, Kathy, I spent way too much on myself. I had to have one of the new swingy Abaco coverups, and a trinket or two. This is absolutely the best shop on the island. It never disappoints. Yes – amazing how much you can find that your REALLY want to have !